» Making Soup For Dummies Don’t Eat Off The Sidewalk! Before you roll your eyes and say, “Who needs a guide on how to make soup? !”, i’ve determined that there are two kinds of cooks in this world: those who need a recipe for everything, and those who fly by the seat of their pants. A lot of times when people ask me for a recipe I shrug, rattle off the ingredients, and that’s that. I’m not big on measuring or planning ahead, which is why I don’t post recipes very often and most of my cookbooks go unused. People who need a recipe for everything, I don’t understand. I am going to assume that they think they can’t cook very well. I have people tell me all that time that they can’t cook. That’s like saying you can’t walk or brush your hair or tie your shoes! It’s not an ability that only some people are born with, like a great singing voice or amazing drawing skills. It takes a little practice and some experimentation. 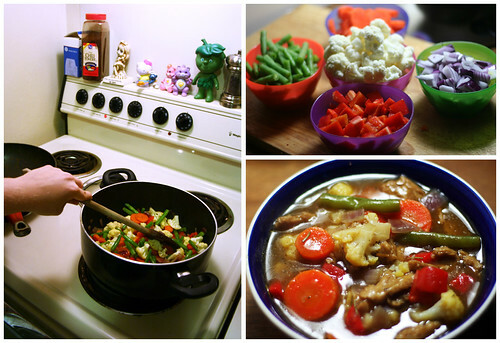 So, I am going to tell you how to make vegetable soup. No recipe, you don’t need it! Which is why I love soup. You can make a ton and eat on it for awhile, and as long as you keep the fat and salt in check, it’s really healthy. Pick out some of your favorite vegetables. I think carrots are a must have and taste best in soup, but you can make up your own mind. Onions, carrots, peppers, potatoes, asparagus, cauliflower, green beans, leafy greens, whatever. Put on some upbeat tunage. Do all of your prep work on your vegetables first. Peel, chop, put them all in their own bowls so when you’re ready to put them in you can just go bam, bam, bam with the bowls. I like my vegetables chopped kind of chunky, myself (less work). For things like potatoes and carrots that take longer to cook, you don’t want them too big or your other vegetables will get overcooked while you’re waiting for those hard fuckers to get soft. Also, if you plan on adding beans, rice, TVP, etc. make sure you have those rinsed or cooked, whatever needs to be done. Heat your oil in your soup pan over slightly under medium heat. The amount of oil depends on how many vegetables you’re using, i’m going to say 1/2 a tablespoon per cup of vegetables, a teaspoon if you’re worried about fat. Don’t jump the gun on putting your veggies in, make sure the oil is well heated first. If you’re using garlic or onions, put those in first, stirring around so everything is good and coated in the oil. After a few minutes, during which you should stir it once or twice, add in any hard vegetables like potatoes, carrots, anything rooty, basically. Continue with the occasional stirring for a few minutes, then add the softer vegetables like peppers, asparagus, etc. Add your seasonings. I like a little salt (because the broth will probably have salt too), loads of black pepper, and herbs like rosemary, thyme, sage, etc. Do the occasional stir for about five more minutes. Now is a good time to pick up your kitchen so you don’t have to do it later. All of vegetables should’ve brightened up in color by now, and maybe be a little browned. Time to add the broth. You can go the pre-made boxed route, or use a boullion cube, or if you’re desperate, water and chicken seasoning. If you’re worried about salt you should probably go with the first choice. If you’re using a boullion cube, dissolve it into warm water first. Add enough liquid to cover the vegetables, or more you you like a really watery soup. Me, I like it a little thicker so I mix cornstarch into a little cold water and pour that in too. Add any extras, like beans or rice. If you’re using leafy greens, put them in low as well. Turn the heat up a little to get it boiling. When the pot begins to boil, lower the heat back down to medium low and cover. It should be bubbling a little, but not going crazy. Check on it in about ten minutes, poke a potato and carrot with a fork and when they’re soft, soups on! This instructional blog is dedicated to my mother-in-law, who is starting an exciting new life that will hopefully include making soup (for me).